I couldn't call the clinic yet because it was still before 8, but he said he was going to stay with me at least untill I could call and get some answers. I ended up leaving a message and the nurse called back about an hour later. She said I should come in and get a blood test to make sure. I showered and went to the clinic and did a simple blood test. The nurse said that it was possible that they were still there but that I could have miscarried or they may not have implanted at all. They said to go home and they'd call us when they got results back. We went to my parents house for a little bit because they live only a few minutes away from the clinic. I cried a little and they were very nice and reassuring. For some reason, I didn't want to hear all the stories about all the women who had also tried and failed. I guess I just wanted to mourn my little eggs. I ended up telling my sisters as well as a couple of my close friends that I had recently spoken to about all this. They were all very nice and cried with me a little. The loss of the eggs started my period a few days earlier than expected and it came with a vengeance. I was used to pretty intense periods from my experience with endometriosis and the only thing that helps those cramps go away is Alleve. But I wasn't allowed to take it until I knew for sure. My mom and sister brought me lunch from Zupas but in order to eat it, I needed those cramps to go away. So I called the doc to get my results. They told me it was negative and that I could go ahead and take any medicine I needed. The tomato basil soup from Zupas was just what I needed. Mom also bought some of their caramel creme brulee which was delicious! She and my sister just chatted and hung out and made me feel a little better. The hard thing was that Justin had finally gone to work but we were supposed to go to a Jazz v Clippers preseason game with my sister Kelly and her hubby Jared. I texted her saying I wasn't sure I was up for it. She replied saying that was fine but still wanted me to come if I could. Then about an hour later, she called and said it would be good for me to get out and think about something else and begged me to come. haha. I didn't want to listen but after thinking about it, decided she was right, so we went. It was the four of us, plus Kelly's friend from high school that I knew a little bit and we all drove together. Luckily the medicine was working great so I felt relatively normal. The game was good and I sat on the end and held Justin's hand the whole time. Fortunately he sat next to Jared so he could talk about the game instead of all my drama. I know it's not really drama and it was ok for me to be sad, but I was grateful that Justin didn't have to think about it as much as I did. haha. It's the only thing I have left right now, Faith. 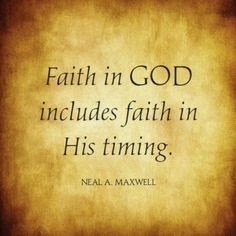 So this is me, having faith in His timing. So what's next? A Frozen Embryo Transfer. I've already started on the medication but I'll write another blog about it later. Till then, I'll continue to ask for your prayers that my one grey circle left will do better than it's siblings. I'm so sorry. You are unbelievably strong. Let me know if you need anything at all.